Few revolutionary inventions and introductions have had the game changing and evolutionary effects on humankind as social media, aside from the invention of the wheel and the first fire of course! While we all reap the benefits of the latter, there are many greater things to be accomplished with social media and Social Samosa’s Social Media Bootcamp is the place to be for it! More than 2.7 Billion people access and leverage the far reaching benefits of social media, and it remains one of the most sophisticated and cost effective mediums of communication not only between people, but between customers and businesses. The digital and social media marketing industry is booming like no other, presenting attractive and never-seen-before possibilities for brands to scale new heights of growth and revenue. Social Media Bootcamp is your opportunity as a brand manager, or any professional associated with a business to absorb the know-how of leveraging social media for unprecedented success. Learn the tact and hands-on knowledge on how to ideate, strategize and execute the flawless social media campaign that can catapult your brand into a league of its own! 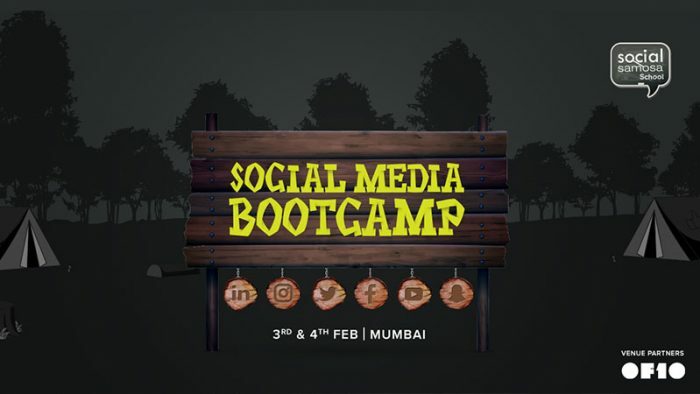 The Social Media Bootcamp is powered by Social Samosa, one of the industry’s elite thought leaders and online journals for everything related to digital and social media marketing. A two-day intense, thorough and all inclusive exercise, the Social Media Bootcamp will be held on the 3th and 4th of February, 2018 from 12 Noon to 6 PM, at Of10 Prudential Ground Floor, Hiranandani Gardens, Powai, Mumbai, Maharashtra 400076. Let’s just say you will be entering your workplace bubbling with ideas, an eye for new details and a mind made sharper by attending the Social Media Bootcamp. Register here.